For the article about the theatre genre, see Summer stock theatre. 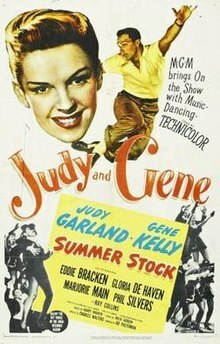 Summer Stock (UK title: If You Feel Like Singing) is a 1950 American Technicolor musical film produced by Metro-Goldwyn-Mayer. It was directed by Charles Walters, stars Judy Garland and Gene Kelly, and features Eddie Bracken, Gloria DeHaven, Marjorie Main, and Phil Silvers. Nicholas Castle, Sr. was the choreographer. Garland struggled with many personal problems during filming and Summer Stock proved to be her final film for MGM, as well as her last onscreen pairing with Kelly. By mutual agreement, MGM terminated Garland's contract in September 1950, something studio head L. B. Mayer said he later regretted doing. Jane Falbury (Judy Garland) is a farm owner whose actress sister, Abigail (Gloria DeHaven), arrives at the family farm with her theater troupe. They need a place to rehearse, and Jane and her housekeeper, Esme (Marjorie Main), reluctantly agree to let them use their barn. The actors and actresses, including the director, Joe Ross (Gene Kelly), repay her hospitality by doing chores around the farm. Although Joe is engaged to Abigail, he begins to fall in love with Jane after Abigail leaves him in an angry fit. Similarly, although Jane is engaged to Orville (Eddie Bracken), she falls in love with Joe. The film's most famous scene is the now legendary final song-and-dance number "Get Happy" performed by Garland in a tuxedo jacket, black fedora, and black nylons to an arrangement by Skip Martin. It was choreographed by Charles Walters and filmed two months after the rest of the film, after Garland sought the help of a hypnotist in Santa Barbara and lost 20 pounds. She performed it perfectly in just a couple of takes. According to New York Times critic Bosley Crowther: " 'Get Happy' finds Miss Garland looking and performing her best." In another notable sequence, Kelly performs a solo dance in a darkened barn, using a newspaper and a creaky board as partners and props; the musical accompaniment reprises "You Wonderful You". The dance "turned out to be one of the breakthrough numbers" of his career. In the film, Garland and Kelly share what may be Garland's best dance duet on screen, the swinging "Portland Fancy" where a square dance turns into a heated challenge dance for them. All songs were written by Harry Warren (music) and Mack Gordon (lyrics) except where noted. Orchestration chores were divided between Conrad Salinger and Skip Martin. Although Garland and Kelly were the stars originally announced by MGM in 1948 to appear in the film, in February 1949 the studio announced that Garland would be replaced by June Allyson. She was suspended in May 1949, during the filming of Annie Get Your Gun, and spent three months in a hospital in Boston being treated for drug dependency. Betty Hutton replaced her on that film, but she was reinstated to the lead in this one, which was her first one following the suspension. Still, the filming was sometimes a struggle for Judy, who was facing many pressures in her personal life, aside from her heavy reliance on prescription medication. Kelly was not the first choice for the role: the producer, Joe Pasternak, originally wanted Mickey Rooney, but was prevailed on to go with Kelly because Rooney was no longer the box office draw he had once been. Busby Berkeley was originally slated to direct the film, but was replaced by Charles Walters before production began. He and Kelly worked on it as a favor to Garland, whose career needed a boost at the time. Later, after filming had begun, Pasternak asked Mayer if he should abandon the film because of Garland's erratic behavior – for example, she was supposed to appear in the "Heavenly Music" number to sing and dance with Kelly and Silvers, but she never showed up for the shoot – but studio head Louis B. Mayer insisted that she be given another chance, saying "Judy Garland has made this studio a fortune in the good days, and the least we can do is to give her one more chance. If you stop production now, it'll finish her." Dance director Nick Castle did not choreograph "You Wonderful You," "All for You", and "Portland Fancy" – these were done by Kelly – but did do "Dig-Dig-Dig Dig For Your Dinner" and other numbers. He also did not shoot "Get Happy," which was filmed three months after the rest of the film; instead it was shot by Chuck Walters. In the interval, Garland had been treated by a hypnotist for weight loss and took off 15-20 pounds; she appears considerably thinner in the number. Garland finished filming and embarked on a long promised vacation from the studio. Soon, however, she was called back to star with Fred Astaire and Peter Lawford in the film Royal Wedding, replacing June Allyson, who was pregnant. Once again, she struggled to perform in the face of exhaustion and overwork. She was fired from Royal Wedding, and her contract with MGM was terminated through mutual agreement. Overall, Summer Stock took six months to film, and was a box-office success. According to MGM's records, during the film's initial release it earned $2,498,000 in the US and Canada and $859,000 overseas, resulting in a small $80,000 loss to the studio at the time. The film, specifically the iconic "Get Happy" sequence, has been referenced in many pop culture contexts. Michael Jackson performed "Dangerous" in a way that paid tribute to the film, most notably at the 1993 American Music Awards and the 1995 MTV Video Music Awards. He and his dancers wore suits, and a dancer stood in front of him until the beginning of the song, just like in the film, in which Garland is covered by a dancer at first. Some excerpts from the song can be heard in his performance. British singer Duffy's "Rain on Your Parade" music video was also inspired by that sequence, and she can be seen wearing an outfit similar to Garland's, and dancing against a white background along some male dancers dressed in suits. Actress Katie Holmes paid homage to Garland, performing "Get Happy" on the television show So You Think You Can Dance. She wore a similar outfit and danced alongside male dancers in suits in front of a match-painted background. ^ "AFI's 100 Years...100 Songs" (PDF). American Film Institute. Retrieved 2016-08-13. This page was last edited on 23 April 2019, at 05:09 (UTC).